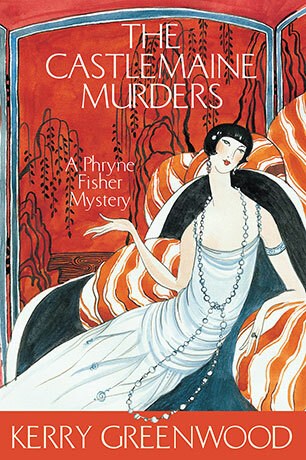 In this thirteenth Phryne Fisher mystery, Phryne returns with a flourish to solve the most horrifying crime yet which takes her from a funfair ghost train to an abandoned mine in the old gold fields. Phryne Fisher is back-as smart and sassy as ever. Phryne Fisher, her sister Beth and her faithful maid, Dot, decide that Luna Park is the place for an afternoon of fun and excitement with Phryne's two daughters, Ruth and Jane. But in the dusty dark Ghost Train, amidst the squeals of horror and delight, a mummified bullet-studded corpse falls to the ground in front of them. Phryne Fisher's pleasure trip has definitely become business. Digging to the bottom of this longstanding mystery takes her to the country town of Castlemaine where it soon becomes obvious that someone is trying to muzzle her investigations. With unknown threatening assailants on her path, Phryne seems headed for more trouble than usual. Meanwhile, Phryne's lover Lin Chung has his own mystery to solve. Feuding families and lost gold fill his mind until he learns that Phryne herself has become missing treasure. Kerry Greenwood has written twelve other novels in the Phryne Fisher series, the most recent being Murder in Montparnasse (2002). She is also the author of The Childstone Cycle, Cassandra, Recipes for Crime (with Jenny Pausacker) and has edited The Things She Loves, a collection of essays about women who kill.